LS NAV Retail is a modern, complete and robust retail management solution that combines functionality, simplicity and value for money. Regardless of industry, LS NAV enables retailers to manage business operations efficiently – making it easier, simpler and faster for customers. LS NAV Retail is a retail management solution in one single application that covers Point of Sales (POS), mobile, store systems, inventory, merchandising, e-commerce as well as headquarters back office functions; allowing you to react fast and effectively when circumstances change, minimising risk and maximising profits. 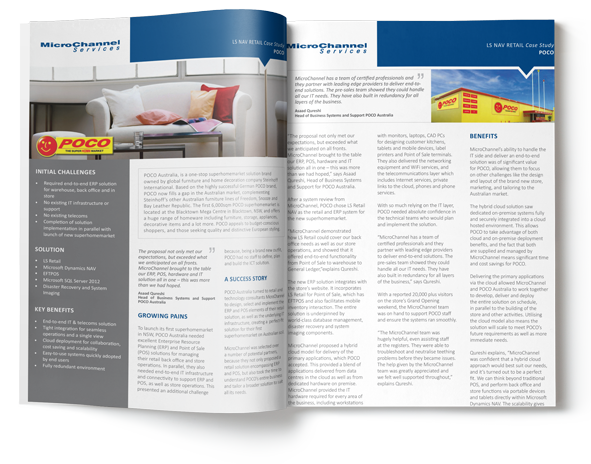 With MicroChannel and Dynamics LS NAV Retail, POCO now has a retail solution that covers their back office needs as well as their store operations, and showed that it offered end-to-end functionality from point of sale to warehouse to general ledger.